A package for creating plots, built on top of the Cairo rendering engine. An ambitious attempt to replace gnuplot. Monadic actions are used to configure a figure, which is a (rxc) array of subplots. Each plot displays a graph with optional heading, labels, legend, and annotations. The annotations themselves may be used to draw diagrams. A figure is preprocessed in preparation for rendering by the Cairo renderer. The Cairo library can be used to output the figure to PS, PDF, SVG, and PNG file formats, or to display the figure in a GTK Drawable context. 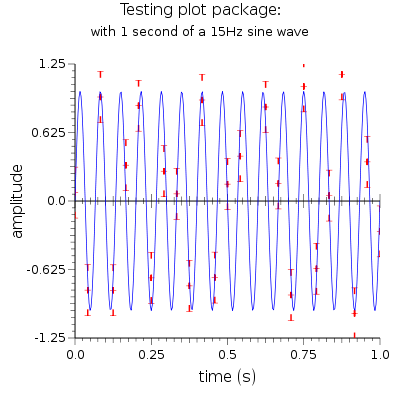 (see package plot-gtk). The preprocessed figure can be embedded as an arbitrary Cairo render, including in a diagram created with the diagram package. Conversely, arbitrary Cairo renders can be embedded in the data region of a Figure. The data series are type Data.Packed.Vector from hmatrix, which, when hmatrix is compiled with -fvector, is a synonym for Data.Vector.Storable from the vector package and are thus compatible with packages such as statistics. For some examples of use, see http://code.haskell.org/plot/examples . your system's package manager and may even already be installed. library will be downloaded and installed for you automatically. pointing your browser to dist/doc/html/plot/index.html.